Can you confirm these amateur observations of Dipsas copei? 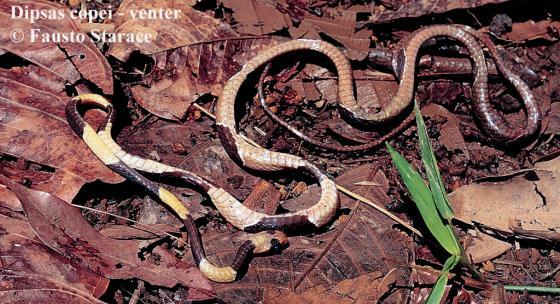 Type locality: “Suriname ?” (fide KORNACKER 1999). Types Holotype: BMNH 1946.1.21.4 formerly 66.8.14.329), male, from collection of Dr. van Lidth de Jeude. Diagnosis The type of L. incerta had nine supralabials, whereas specimens of D. copei have 10–11. Comment Leptognathus alternans FISCHER 1885 has been removed from the synonymy of D. incerta by PASSOS et al. (2004). D. copei has been synonymized with D. incerta by PASSOS et al. 2004 and revalidated by HARVEY 2008. 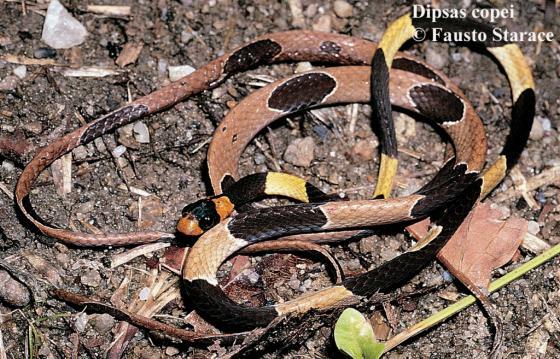 However, D. copei may be a synonym of D. praeornata (here still a synonym of Dipsas latifrontalis).The neotype designated by PASSOS et al. (2004) is invalid fide HARVEY 2008. D. copei is not listed by GASC & RODRIGUES 1980. Etymology D. copei was named after Edward Drinker Cope (1840-1897), American herpetologist.